How does the Supreme Pilates Pro compare to the Supreme Toning Tower? We often get asked to compare our two products, the Supreme Pilates Pro (the "Pro") and the Supreme Toning Tower (the "Tower"). ​The two products are similar but the Pro has a few extra's (that's why it's a little more expensive). 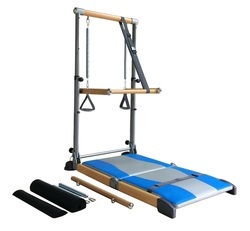 The Supreme Pilates Pro has a 3 position bar/tower, two resistance coil sets (13" & 17"), a folding pad, and comes with 5 DVDs. Find out more on https://SupremePilatesPro.shop/​. You can get additional DVDs, accessories, and spare parts if you click HERE. Folded down it is about 8 inches thick. The shipper box is 36x30x11 inches and about 62 lbs. How High is the barre? 40 inches above the mat. The shipping box is 52x28x7 inches and about 42lbs.